Xian Lu started taking flute lessons as a child. His teachers include the esteemed composer and principal flutist of Shanghai Folk Music Orchestra Chenglong Zhou, flutist Jingsheng Dai, and Professor Chunling Lu, the renowned flutist of Shanghai Conservatory of Music. While still in his teens, Xian Lu’s proficiency of the flute instrument was widely recognized when he participated in numerous competitions and music festivals in the Shanghai area. In 1979, Mr. Lu entered Nanjing Normal University’s Music Department and continued his studies under the tutelage of the famous flutist, Professor Keren Lin. In 1991, Mr. Lu went to the Department of Music in Turku University of Finland and began his studies in musicology. Recently, Mr. Lu was invited to the United States to become the guest professor of wind instruments in Laney College, Oakland, California. 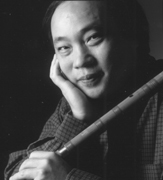 During his college years, Xian Lu’s deep love for music propelled him to pursue a variety of topics ranging from flute performance to music theories, resulting in a well-rounded, systematic training. He began to develop his own performing style, and his reputation as a virtuoso soloist started to spread all over the country. In 1983, Mr. Lu graduated from college and went on to become the lecturer in the Folk Music Instruments at the Department of Arts, Shanghai Educational College. In 1986, Mr. Lu went to Australia on a two-month trip, during which he gave numerous lectures and recitals. In 1989, Mr. Lu won the first prize in wind instruments at the First Chinese Folk Music Instrument Competition. Mr. Lu’s musicianship and his mastery of the flute instrument received critical acclaims not only at home but also around the world. In 1991, having finished his studies in Finland, Mr. Lu was invited to participate in many local art festivals and gave numerous performances and lectures on Chinese traditional wind instruments at colleges, museums and music halls around the country. Since 1986, Mr. Xian Lu has been invited to perform in many countries, including Australia, the Netherlands, Belgium, Sweden, Russia and the United States. Xian Lu’s flute playing incorporates both the southern and the northern styles of Chinese music. He has an exceptionally pure tone that is as moving as it is artistic, particularly when he interprets many of the folk music in China’s southern provinces. In addition to flute, Xian Lu also plays many of the traditional Chinese wind instruments, including Xiao (vertically-played-flute), Bawu (copper-reed flute), Xun (Chinese ocarina). He is one of the best flutists in China’s younger generation.